Map Samples - 2016 Maps of the Month - Maps & Facts Unlimited, Inc. In 2015 the former AIMS student achievement tests were replaced with a new series of tests called AzMERIT. The final results were released in October 2015 to mixed reviews. Some schools that scored well on the former AIMS tests did not perform well on the AzMERIT test; and vice versa. In addition the scores were very compressed making it difficult to compare school performance. This month�s map plots the top 15 Elementary (5th grade) schools in including ties. As noted, with the exception of the top five schools the remaining 10 schools all scored between 71 and 74 with ties at 71, 72, and 73. Median Sale Price Up 6.58%! Maps & Facts has been tracking house prices in numerous configurations since 1995. (Our sale data base goes back to 1971) While most market watchers may agree on the direction of the market, results and forecasts are often mixed due to changes and differences in the data relied upon and the methods used to measure change. 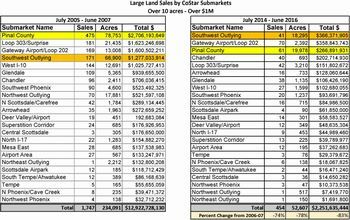 In June 2012, Maps & Facts started mapping median re-sale prices for a discrete sub-set of the larger Metro Phoenix market and back tested it to 2001. Our results are unique because we track the same sub-set of houses i.e. : Built between 1990 and 1999; and, which sold between 2001 and 2015 for $100,000 to $1,000,000. We believe this is more realistic because the data set doesn�t change. The only change is the houses are getting older. This year�s sales are depicted on the following map. It is interesting to note the concentration of sales near freeways. The attached Graph shows median price changes by year. 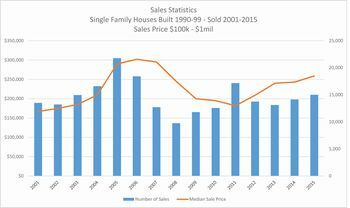 The attached Chart compares the number of sales and median sale price. This month�s map shows several �Phoenix favorable� demographics headlined by Forbes ranking Phoenix 15th among America�s 20 Fastest-Growing Cities for 2016. Forbes ranked the top 20 of the 100 most populous metropolitan statistical areas by: estimated population growth; job growth; gross Metro product growth; federal unemployment data; and, annual pay for college-educated workers. Austin was # 1. Second was San Francisco; Dallas was third. Based on these rankings, Texas was the winner. 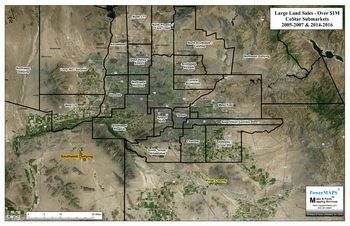 Utah also ranked well with 2 cities in the top tier; however as Forbes pointed out, Salt Lake City and Ogden are part of a contiguous region along the Wasatch front. While San Francisco and San Jose ranked #2 and #8 respectively, Oakland only ranked 13th. Phoenix�s closest neighbors; San Diego, Denver, and Las Vegas ranked #11, #12, and #18 respectively. 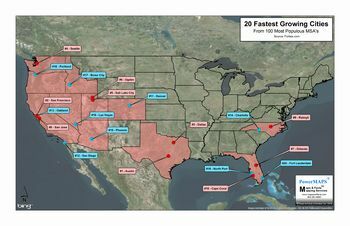 An equally interesting visual is: except for South Carolina and Florida; all other cities (SMA�s) that made the Forbes cut are in the West/Southwest. Is there any reason to believe these trends will not continue for the foreseeable future? As our residential markets emerge from a 10 year hiatus and Phoenix once again arises from its ashes, we are starting to see some impressive signs of life. For example, in 2015 the Loop 303 and I- 10 submarkets had a very good year. Based on recorded sales, there were 1,246 new home sales in at least 34 active subdivisions. Prices ranged from $165,000 to $340,000 with a median of $232,006. This month we�ve focused on Pinal County. According to ARMLS, there were 5,327 single-family sales in the past 12 months. 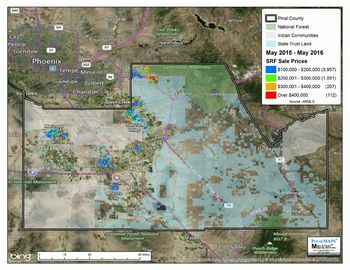 Not surprisingly, as shown in red on Map #1 below, sales over $400,000 were concentrated in the Gold Canyon and San Tan sub-markets. As shown in blue, 3,957 sales or about 75% were in the more affordable $100-$200,000 price range representing the Coolidge, Casa Grande, and Maricopa submarkets. 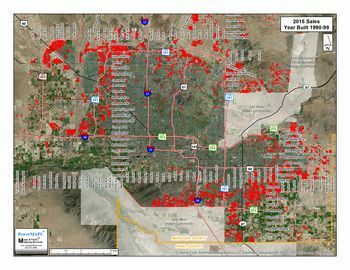 Map #1 also shows that a whopping 75% of Pinal County lands are �government� owned. 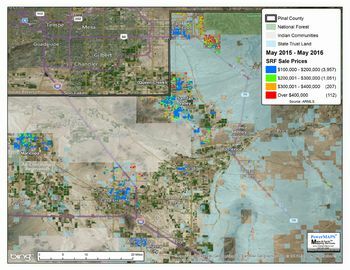 Map #2 zooms in on the western half of Pinal County where all 5,327 sales are located. This month we compared the total dollars invested in Metro Phoenix residential land transactions (over 10 acres and over $1 million) between the 24 months immediately preceding the start of the 2007 recession with the 24 months preceding July 2016. As shown below, from July 2005 to June 2007 there was about $13 billion in residential land transactions in the study sub-markets. From July 2014 through June 2016, the total transaction value was a little over $2 billion; a decline of 83%. A long way from the peak! Due to the availability of raw land and size, the top submarkets in 2005 - 2007 are still top submarkets today. Last July we mapped Class �A� vacancy rates by CoStar submarkets showing eight (8) submarkets with vacancy rates under 10%; a significant improvement over 2014, and, a leading demand indicator for new office construction. This month we compared vacancy rates for July 2016 with July 2015, again by CoStar submarkets, noting that while only five (5) submarkets� rates were lower than 10%, 19 additional buildings had been added to the Class �A� inventory pushing some submarket vacancy rates over 10%. I.e. : with five (5) new �A� buildings added to the Chandler submarket, Chandlers� vacancy moved from 6.1% to 18.4%. Even so, the Metro Phoenix Class �A� vacancy rate remained relatively stable at 16.2%. Looking at the larger submarkets with no change in the number of buildings, the Camelback Corridors� 22% vacancy rate hardly moved; the Midtown submarket improved from 30.2% to 24.1%; and, the Downtown submarket remained near 15%. * Since July 2015, CoStar re-assigned six (6) Class �A� buildings from the 44th St. Corridor submarket to the Tempe submarket making time series vacancy rate adjustments for those submarkets risky. As of March 2016 the College Board revised the national SAT tests. To our knowledge, the 2016 results have not yet been made public. Thus, the latest publicly available SAT scores are from 2015. This month�s map shows the top 10 Metro Phoenix public high schools and how each performed on the 2015 SAT. Our map and data do not include high schools without attendance boundaries including private charter schools or in-district charter schools. Under the 2015 scoring system the maximum score was 2400: fifteen hundred (1500) was the national (student) average. Because the average school test scores were close, we�ve also presented an additional chart summarizing the next 10 schools� scores. As noted, our top 20 public high schools all had average SAT scores over 1500! As with any large sample, these scores are representative and may not reflect differences in school programs, junior/senior student mix, number of students, and other variables. Click here to view The Phoenix Business Journal�s list of the Top 50 public high schools in Arizona ranked by 2015 SAT score. True Trade Area analysis starts by mapping the targeted data, say Median Household Income, over a larger geographic area superimposed over color-coded census tracts. Then it�s comparatively easy to identify smaller but similar polygons, or patterns, within the larger geographic area and to select a True Trade Area. To demonstrate, the following map is a traditional 3-mile ring centered on Camelback Road and 44th St. 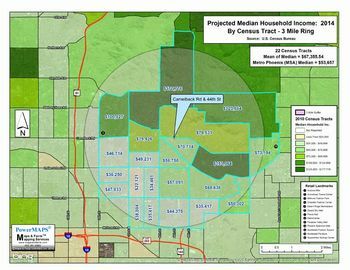 It is easy to see there is a wide range of incomes within the 3 mile ring map and a median of medians of $67,000. Contrast that with the above True Trade Area map. 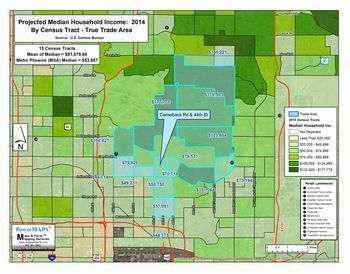 The median of median income increases to $92,000 and Camelback Road and 44th St. is no longer centered. The trade area has moved north and east. True Trade Areas can come in all shapes and sizes. They will never be rings! We frequently receive inquiries as to where re-sales are located and their prices. 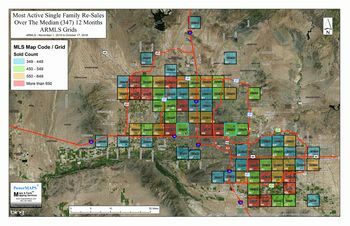 Because mapping this answer requires layering several variables, it�s an excellent application for GIS mapping. So, this month we researched all single-family re-sales over $100,000 by ARMLS Grids over the preceding 12 months. In total, there were about 40,000 sales with a median of 347 per Grid. Because of the large number we color-coded only those Grids over the median. We also calculated the median sale price for each grid. Shown, the highest was grid P36 at $510,500 with 498 sales. The lowest was grid P32 at $141,000 with 519 sales. Should you be curious about specific details, attached are summaries of the layers used to prepare the map. If you sense traffic has gotten heavier over the last few years; you�re right! 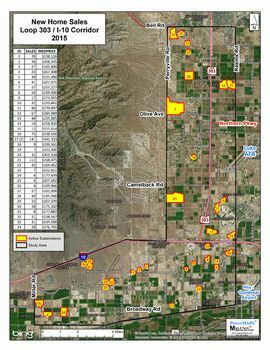 This month�s map depicts the traffic counts along the valley�s major east-west arterials from Pima Rd. in Scottsdale to 91st Ave in Glendale. 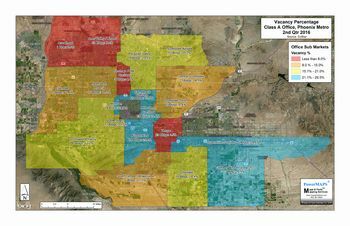 If you do the math, Indian School Road is still the most heavily trafficked east-west arterial in the Valley. You might notice too that traffic is a little lighter near the Loop 101 segments. Not sure why? Drive Carefully! 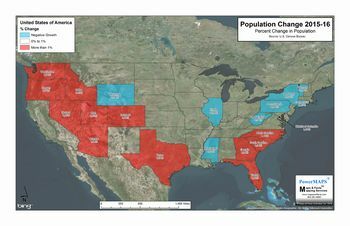 The Census Bureau recently released its latest stats for population change by state from July 1, 2015 to July 1, 2016 (article link). The tables are hard to understand so this month�s Map of the Month shows the changes by color! While the nation only grew by 0.7%, Utah was the leader at 2.03%. As easily seen on our map, the Northeast is losing population while the West, Northwest, and Southeast are gaining.